Works best with medium to high arch feet. Features some metatarsal cushioning for the ball of the foot. Acti-Flex shell posts rear foot, provides superior motion control and relieves heel spur pain. Pedura Cushioning foam base layer for continuous all day comfort. Highest arch I've found Great arch support. I've tried Powerstep Pro (sold by my Podiatrist) and New Balance full length insoles for my plantar fasciitis and high arches, when a friend suggested he had success with some Redi-thotics insole. I first bought the Max because their home page listed "higher arch" for the Max. But the Max was too big to fit in my shoes (confirmed by Redi-thotics that they run big), and when I just layed it against my foot, I didn't feel enough arch support.So then when I perused the Redi-thotics site further, I found their "Clinical Suggestions Matrix," where it showed the Control provided more arch support than the Max for pes cavus (high arches) than the Max. Success! 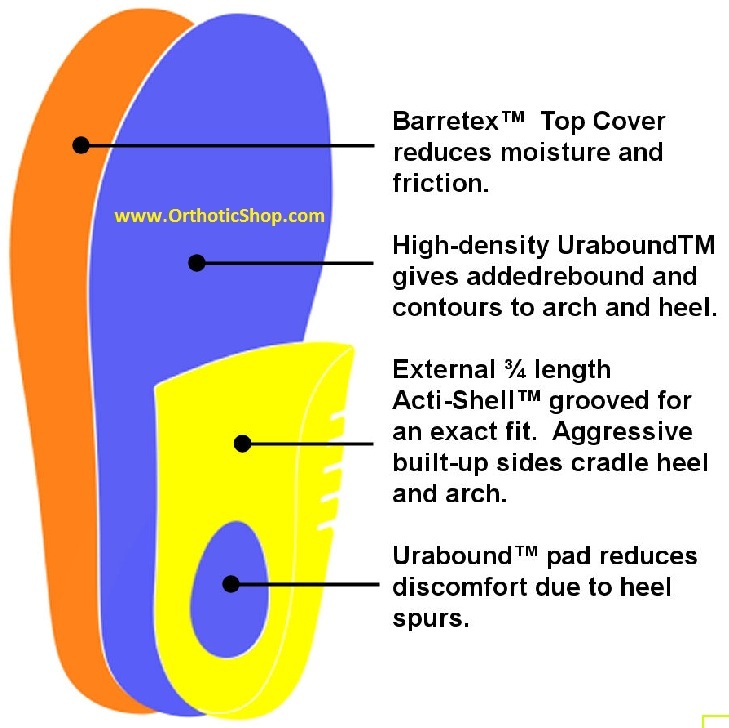 High arch support, best I've found.P.S. Exchange process through OrthoticShop was painless. These orthotics were prescribed by my podiatrist. They instantly resolved my problem. The first couple of pairs (one for each set of athletic shoes) lasted for two years before beginning to break down in support. I wear them daily. Advantages: This style transfers perfectly to my hiking boots. It corrected my walk and gave my arches much-needed support.